I live in the Lansing Michigan diocese. Our bishop Carl Mengeling, himself a convert from Lutheranism, submitted his retirement letter over two years ago. This week we found out we had a new bishop — Earl Boyea. Our pastor, Fr. Ed Fride, knows this new bishop who was/is an auxiliary bishop for Detroit and professor at Sacred Heart Major Seminary. He said Bishop Boyea is faithful, orthodox and a great choice. We are all very excited. 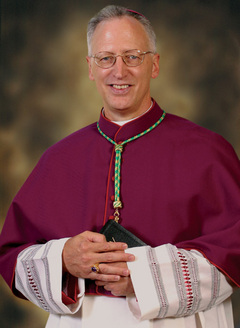 LANSING, Michigan, FEB. 27, 2008 (Zenit.org).- Benedict XVI appointed Auxiliary Bishop Earl Boyea of Detroit, Michigan, as the leader of the Lansing Diocese. Bishop Boyea, 56, succeeds Bishop Carl Mengeling, 77, who retired for reasons of age. Earl Boyea was born in Pontiac, Michigan, in 1951 and ordained in 1978. In 2000, he was named president and rector of the Pontifical College Josephinum, a position he held until 2002. In that year, Pope John Paul II named him auxiliary bishop of Detroit. His motto, in manus tuas (into your hands), is taken from the final words of Jesus on the cross, according to the Gospel of Luke. Bishop Boyea is a member of the U.S. episcopal conference's Ad Hoc Committee on Priestly Formation. The Lansing Diocese has a population of some 1.8 million, with 222,519 Catholics.